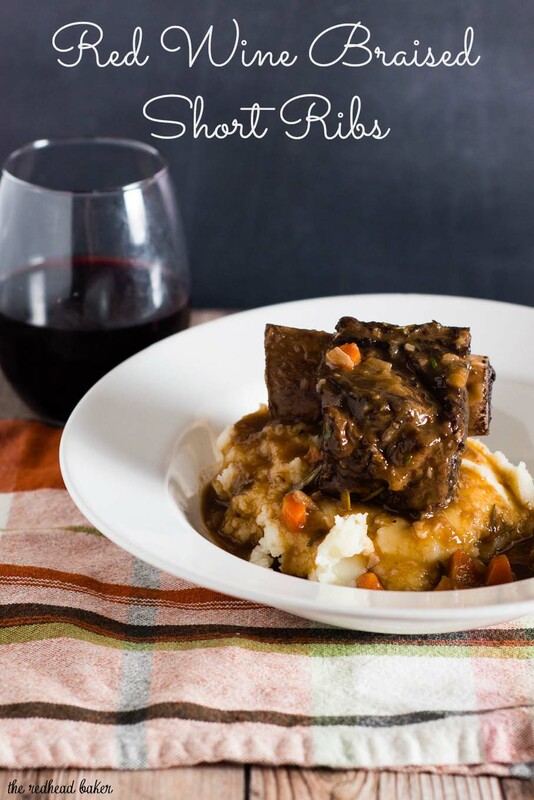 Braised short ribs become fall-off-the-bone tender in a mixture of red wine, beef stock, and garlic. Serve over mashed potatoes for a true comfort meal. I have a love-hate relationship with winter. I love sitting in a warm room, wrapped in a blanket with a mug of hot cocoa, watching the snow fall. It’s so beautiful and peaceful. Then real life comes crashing in, bringing me back to reality. I’m an adult. I need to get dressed, bundle up, and get outside because my son has soccer practice at the indoor gym 6 blocks away. Might as well clean off the car while I’m out there, because I have to drive to work the next day. Even when I don’t have to go outside, and can stay nested in my blanket in my warm apartment, there’s something about knowing that the high temperature for the day will be no higher than 16 degrees F that makes you crave comfort food. I love this braised short rib dish on days like that. 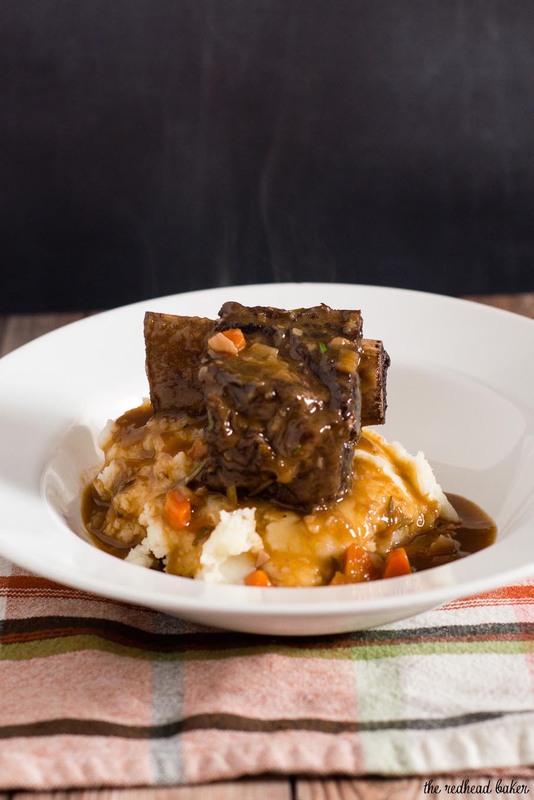 Not only is rich and warming and comforting, braised short ribs take 2 hours to cook, which fills the whole apartment with a comforting aroma. 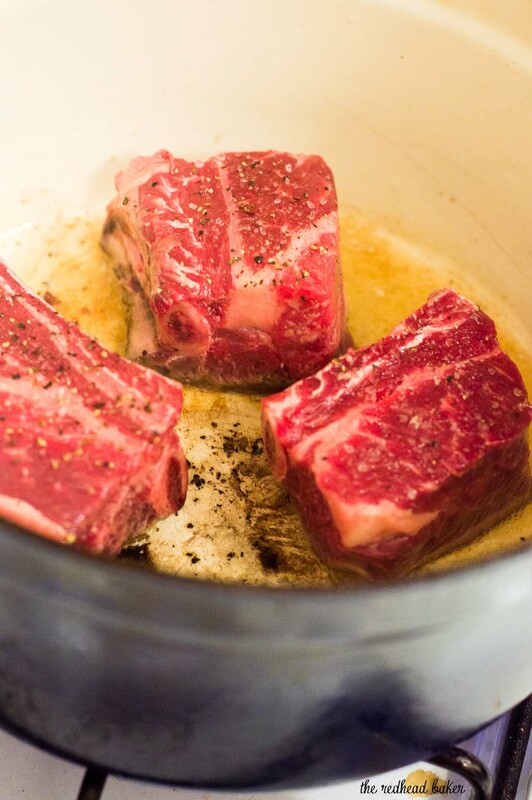 It starts with short ribs, a cut of meat that requires a long cooking time due to the amount of connective tissue in the meat. After searing, the meat braises in a red wine and beef stock mixture. 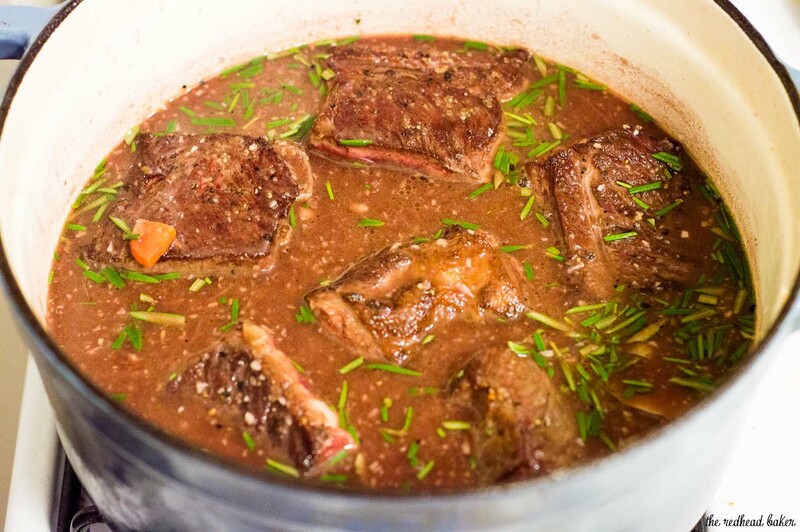 After the meat has finished cooking and is transferred out of the braising liquid, the fat is skimmed off, and the liquid is further reduced to make a flavorful sauce. This is a classic Sunday dinner recipe, rather than a weeknight meal. 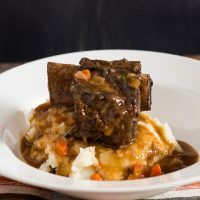 It’s delicious enough to serve to guests, and compared to other more desirable cuts of beef, you can get a larger quantity of short ribs for a decent price. 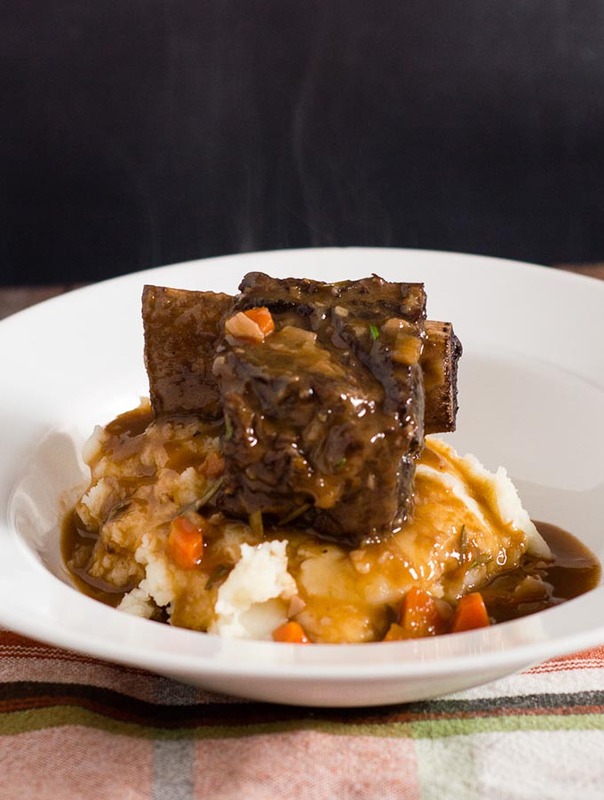 No steak knife needed for these braised short ribs. The meat literally falls off the bone as you pull it out of the Dutch oven, and can be pulled apart with just a fork. Serve over mashed potatoes or creamy polenta to soak up that delicious sauce. Place a Dutch oven on your stove top. Heat 2 tbsp of the oil over medium-high heat. Season the short ribs all over with salt and pepper. Add half of the short ribs to the pot and sear on all sides, waiting until the short ribs release themselves from the bottom before trying to turn them, about 5 to 6 minutes total. Transfer to a plate. Repeat with second half of short ribs. Transfer the second batch to the same plate. Add the remaining olive oil to the pot and heat. Add the onion and carrots and cook, stirring occasionally, until the vegetables soften, about 5 minutes. Stir in the garlic and cook for about 1 minute. Sprinkle in the flour and stir for one minute. Slowly pour in the wine, then the stock. Whisk in the tomato paste, rosemary and bay leaf. Return the short ribs to the pot. 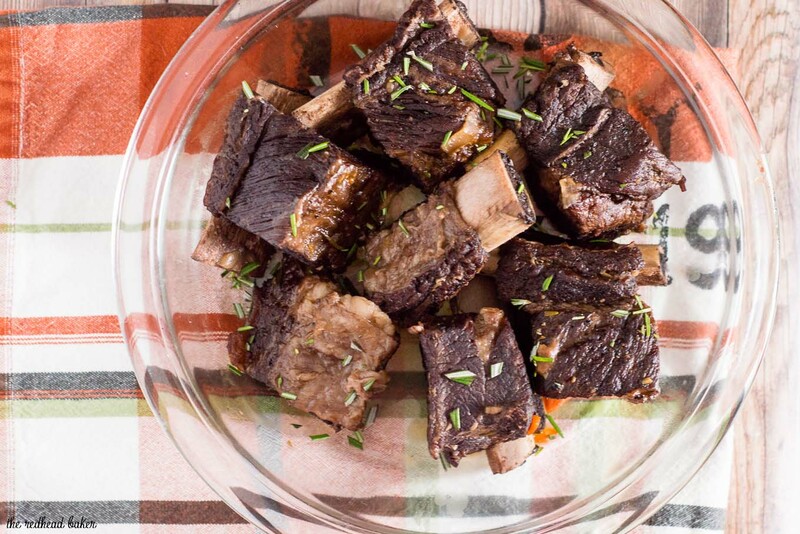 The short ribs should be barely covered with liquid. If not, add hot water as needed. Bring the liquid to a boil. As soon as the mixture boils, cover the pot, turn off the heat, and place the pot in the oven. Cook, moving the position of the ribs every 45 minutes or so to be sure that they are covered with liquid and are cooking evenly, until very tender, about 2 to 2 1/2 hours. Transfer the ribs to a deep serving platter (don’t worry if the meat separates from the bones), and tent with aluminum foil to keep warm. Let the cooking liquid stand at room temperature for 5 minutes. Skim off the fat from the surface and discard. Bring to a boil over high heat. Cook, stirring, until reduced by about one-fourth, about 10 minutes. Discard the bay leaf. Place a serving of mashed potatoes or polenta in a serving bowl, and top with some of the ribs and sauce. Serve immediately.